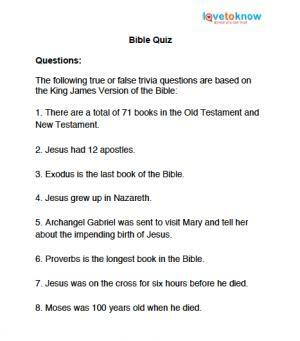 Printable Bible trivia questions are good to have on hand during family nights either at home or your local church, or during a religion or Sunday school class. Just print them out and file them away for that special gathering. If you plan to use these types of questions in a family atmosphere, make sure they are geared toward all age levels. During these family or fellowship get-togethers, there is nothing more special than testing everyone's knowledge about the Bible. Be sure your Bible questions and answers are accurate and double check your facts against not only what you may find on the Internet, but also with what is written in your own Bible. There's nothing more embarrassing than having your trivia answers wrong! 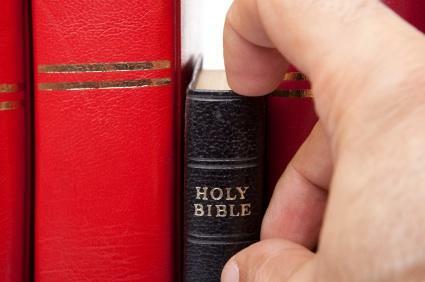 Print LoveToKnow's Bible trivia questions for your next religious gathering. These true or false questions are geared toward older children and young adults, although everyone can enjoy them. If you need help downloading the printable, check out these helpful tips.